Back in June, we were invited to the home of Peruvian-born and raised Giuliana and Miguel, both of whom met at medical university, after which they relocated to the states. Our first encounter with Giuliana was at friends Paula and Mike Graham’s house for their respective sons high school graduation party. With Russ’s command of the Spanish language, we hit it off pretty quickly. She extended an invitation to us in June to dine at her house for an authentic Peruvian-style dinner, but unfortunately, Giuliana had to fly to Peru for a family emergency the night of the scheduled event. Nearly 3 months later we received another offer to host us for dinner, which we quickly accepted. With their proximity near the Graham’s, Paula invited us to enjoy cocktail hour first in their backyard over some select cheeses, nuts and olives on an unusually balmy October evening. The “pre”cocktail hour at the Graham’s. You see, even though the invitation was for 7:30, it is considered impolite to arrive on time—a formality I find hard to adjust to (not so much Russ 😉 ). According to Peruvian custom, being an hour late is “fashionable,” though we kind of split the difference pulling into their driveway around 8:00 p.m. with bottles of wine and fresh flowers in hand. Giuliana selects a vase for the flowers while Miguel uncorks the wine. Pisco Portón is a super premium pisco, which is a Peruvian grape-based white spirit. It is crafted at Hacieda La Caraved, established in 1684 in Ica, Peru. Like all good things, pisco began as an act of rebellion. In 1641, the King of Spain—Philip IV—imposed heavy taxes on all wine produced in Peru. In response, his new world subjects dodged the onerous tax by distilling the year’s grape harvest. In hand-forged copper vats nearly four centuries ago, a new white spirit was born and christened pisco, a reference to the Port of Pisco from where this new spirit was exported. Pisco means ‘bird’ in the indigenous Quechua language. To this day, Peruvians call it their native spirit. While sipping our pisco-based drinks, Giuliana retrieved a few trays of cooked scallops with parmesan cheese from the oven that were baked right on sea shells for an artistic presentation. Dogs of the smaller variety always seem to gravitate to Russ, and their little collie, Rosa, was no exception. She found a very comfortable little nook at Russ’s feet by the bar stool. After some laughter and getting to know each other, it was time to move into the dining room for the Peruvian feast. The main attraction, for me at least, was the beautifully colored, and formed, mound of saffron rice and the shrimp, clam and squid stew with peas, along with a side of catfish fillets. The sauté was reminiscent of a Zarzuela. Other accompaniments included sides of corn, and an interesting salad composed of lettuce, hard boiled eggs, olives and cooked potato slices in a spicy pepper and cheese sauce. We had an absolutely lovely evening, one we finally had to end because it was getting late and we still had a hike to get home. So before we said our goodbyes, I made sure to take a few snapshots of the ladies and then the gentlemen. The place is so new that they don’t even have their sign up yet! Arpeggio is an Italian/Mediterranean BYOB which opened in July, 1995 in Spring House, Montgomery County, PA, about 10 miles from the Graham’s home in Oreland. The original cozy 12-table space and the Spring House area were a perfect fit for restaurateurs Mary Cullom and Chef Hamdy Khalil and they thrived there for seven years. Then the larger space next door became available and since they were bursting at the seams, Arpeggio was lovingly expanded. Restaurateurs Mary Cullom and Chef Hamdy Khalil. In May 2003, they reopened with a new state of the art kitchen and a transformed décor. 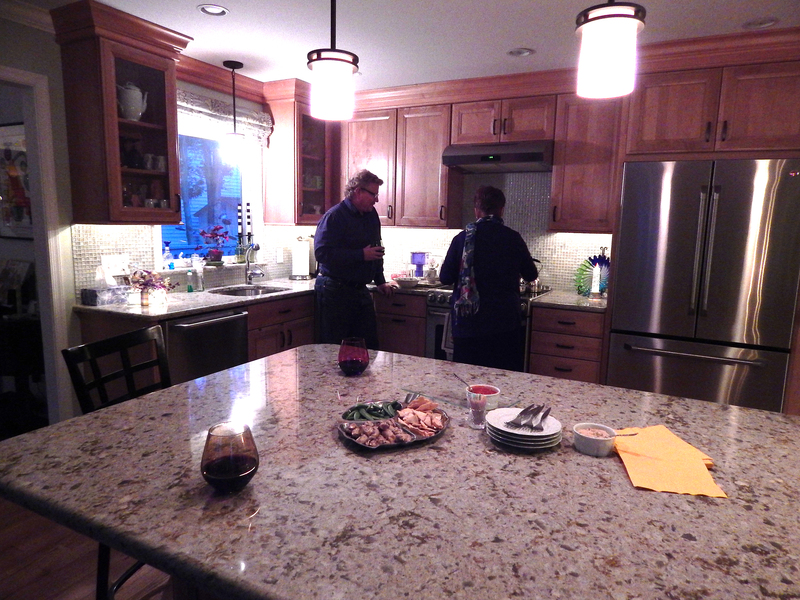 The kitchen sported a second wood burning oven in the back for the preparation of special entrées. The dining room featured a two-sided fireplace in the center, private wine lockers and an outdoor patio that is partially covered with a large gable. But they relocated and enlarged once again! The latest location, which opened very recently, is roughly 75 yards across the parking lot, and the new space — which was designed by revered Philadelphia architectural and design firm DAS Architects — is a massive 4,550 square feet inside with 24-foot high soaring ceilings, an upscale upgrade from the previous 2,800 square feet! An interior view of one of the dining areas. It was already after 8:00 by the time we arrived, and we figured since it was a summer weekend, many folks would be out of town. Wrong! The place was absolutely booming (they don’t take reservations) and we were told there was an hours wait time! Oy vay. But since it was a BYOB—and we carted a few good reds with us—we asked for some wine glasses and moseyed out to the large deck—which was not up and running for business yet. Yes, it took pretty much the full hour before our names were called. But we secured a nice corner table which allowed for easier conversation. And that conversation was, what were we going to order for starters? Back to the appetizers. We opted for the combo platter and beef skewers, described below. MEDITERRANEAN COMBO PLATTER: Sampling of humus, baba ganush, tabbouleh, falafel, stuffed grape leaves and feta; served with tahina and two fresh colossal pitas! MEDITERRANEAN BEEF SKEWERS: Lean and tender flank steak skewers in a Mediterranean style marinade; served over a bed of crispy onions. Then we needed to get serious about entrées. After much back and forth, Paula opted for the Sea Bass, which she gushed over; Lynn selected the Mixed Grille; and the guys both chose the Chicken Taouk. What the heck is that? Shish Taouk is a traditional marinated chicken shish kebab of Middle Eastern cuisine. 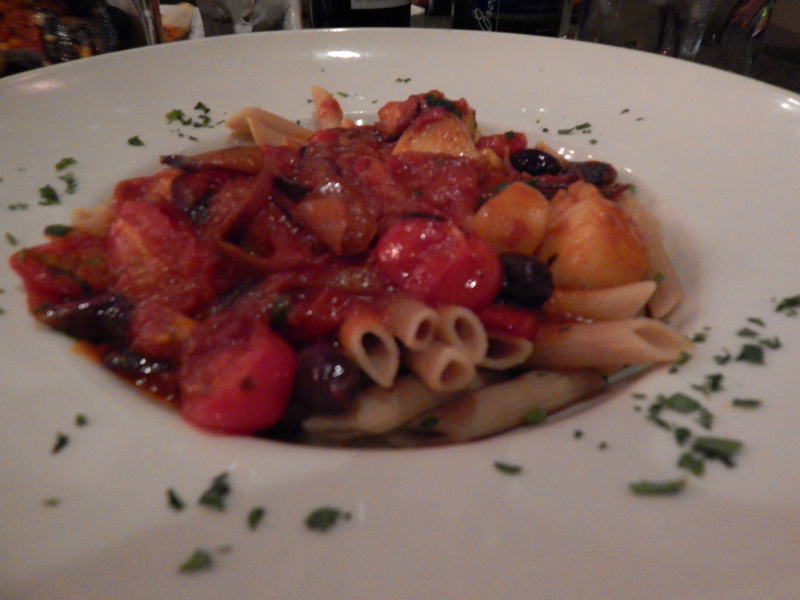 And since they offer a wide variety of Mediterranean offerings, it made sense. There’s never a dull moment when visiting with the Zarrilli’s, and the trend continued at our most recent invitation to start the holidays a few weeks early with a festive Christmas themed dinner at their home in Hamilton, NJ. To start things off, Mrs. Z premade a pitcher of real tasty Pomegranate Cosmos concocted with Pama liqueur and some Grande Marnier among other ingredients. These are definitely finding their way to our cocktail short list! Provisions are at the ready for cocktail hour. Rosanne is so talented when it comes to crafting and decorating, and she pulls out all the stops with her holiday decor. I don’t think there’s a square foot that isn’t adorned with something, even the dining chandelier had snowflakes hanging from it! Did you know that Gilroy, California is home to 90% of the American garlic crop? True fact. I believe the origins of this appetizer came from the Gilroy Garlic Festival. Well, you don’t have to go all the way to Cali to try these babies, just make a batch for yourself, they are delicioso… FYI, in Step 2, Russ added the entire 1/2 cup of oil initially, but then strained about half of that off because we thought it was too oily, so keep that in mind when making yours. After enjoying cocktail hour, we meandered into the dining room where the festive salads were already plated. Wow, were they good! I did ask about the dressing, though I can’t remember exactly what it consisted of, I just know I really liked it! One can’t help but take note of the red and green theme continuing throughout the course(s) of the night. But let’s talk about the star of the show which was Beef Bourguignon made with filet mignon, compliments of Food Network Chef Ina Garten—it was the bomb!! And paired with a cheesy polenta and roasted Brussels sprouts with pancetta, a winning combo that was comfort food on steroids! Russ loaded up my plate and I tried my darndest to finish, but had to relent in the end. Then came dessert. I was definitely too full to indulge, but Russ was not going to miss out and had nothing but raves about it. Mrs. Z assembled egg nog ice cream with a blackberry compote—which fittingly turned red—that came swimmingly together in martini glasses for that added touch of class. And what’s a Yuletide meal without Christmas cookies? So a plate of assorted confections adorned with red and green Hershey Kisses also found their way to the table. Heat oven to 375°. Toss 2 tbsp. oil, the mushroom caps, salt, and pepper on a baking sheet. Arrange stem side down; bake until tender, 25–30 minutes. Heat oven broiler. Heat remaining oil and the garlic in a 12” skillet over medium; cook until garlic is golden, 4–6 minutes. Using a slotted spoon, transfer garlic to a paper towel to drain. Add chopped mushroom stems, shallot, salt, and pepper to skillet; cook until shallot is soft, 3–4 minutes. Add sherry; cook until evaporated, 2–3 minutes. Transfer to a food processor; add parsley, sage, and egg white, and pulse until coarsely ground. Transfer to a bowl; stir in reserved garlic, the Gruyère, and panko. Fill caps with 1 tbsp. filling; return to baking sheet. Drizzle with olive oil; broil until tops are browned, 2–3 minutes. Ed Mortka, never having been to the Chinatown section of Philadelphia, suggested we meet there for dinner and drinks this past Saturday. To that end, Russ did a little research and output a list of about 30 possible eateries. I narrowed it down to nine restaurants, and we sent those choices to the Mortkas, with Karen selecting the winner, Lee How Fook. Now that’s what I call teamwork! The difficult to find entrance to Hop Sing Laundromat. First, you have to find the place. With Ed and Russ both using smart phones you’d think it would’ve been easy. But Hop Sing does not have a sign out front, nor anything else to indicate it’s whereabouts. One clue, we noticed four middle-aged couples standing outside a metal-caged door, when eventually a doorman popped his head out. Based on a cash-only policy and a passerby’s comments about knowing some secret code, plus a strict dress code: no sneakers, no shorts, no tank tops, we said “The Fook With This” and opted to patronize another establishment, which led us to Bar Ly. Both couples enjoying pre-dinner drinks at Bar Ly. It’s Chinatown’s first craft beer bar, that boasts a high-quality lineup of 60 taps. They also serve cocktails and wine by the glass, so something for everyone. And if you’re so inclined, large TV screens line the walls airing every possible sport for your viewing pleasure. Luckily it wasn’t loud, and it was happy hour so we enjoyed catching up over low-priced drinks. A little over an hour later, it was time to walk the few short blocks to dinner. Located on North 11th Street in Philadelphia, Zagat-rated, BYOB Lee How Fook has been in business for over 30 years. Chef and founder Shing Chung immigrated from China bringing his cooking talents to Philadelphia’s Chinatown in the 1970’s; while his son-in-law Andrew has turned it into a modern day BYOB classic gem with an authentic take on Cantonese cuisine. 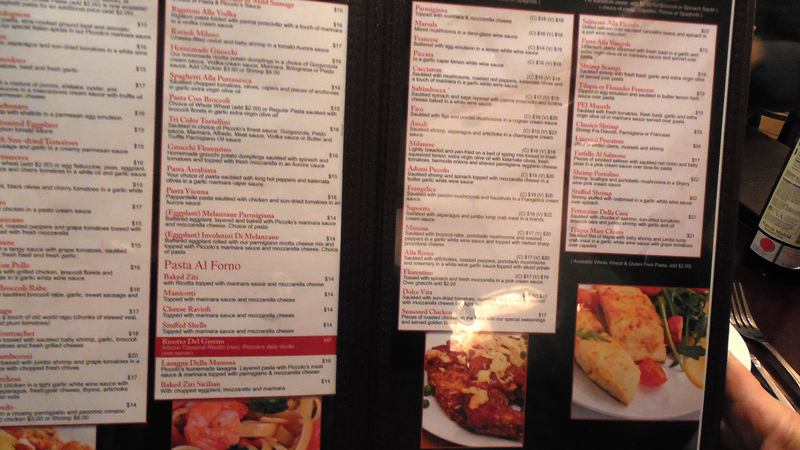 And that authentic menu is extensive, with all choices very reasonably priced. In fact, one site says the price averages $30 per couple (our tabs were just slightly higher than that.) Choices include chef’s specials, restorative soups, whole steamed fish, and excellent hot pots, among many other options. I got to tell ya, it was extremely hard to narrow down to only a few selections. We all loved the pan-seared pork dumplings. The mixture for the lettuce wraps was made up of chicken, scallions, bean sprouts and sauce. A bit of meat mixture in a lettuce leaf before it is wrapped. A small bowl of Crab and Asparagus Soup. Deciding to start with some shared appetizers, we chose Pan-Seared Pork Dumplings, Lettuce Wraps, and Crab and Asparagus Soup for four. 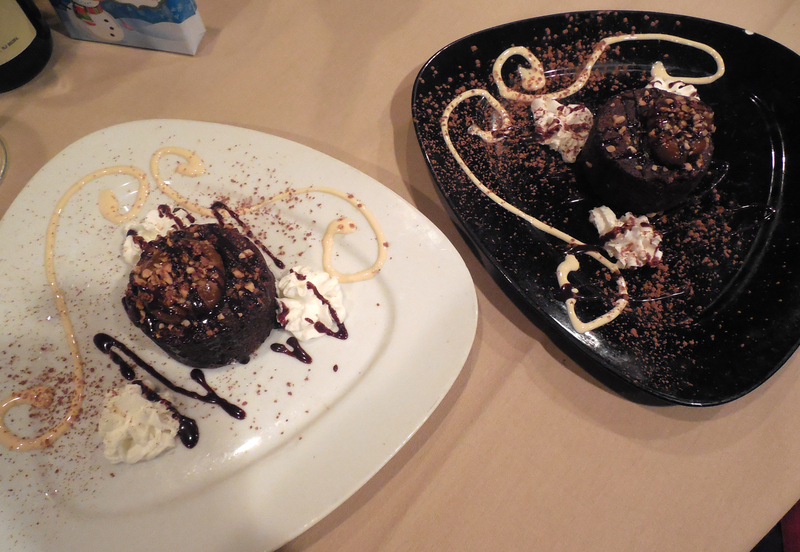 There was audible ooohing an aaahing as we savored every bite. One complaint though, they brought the entrees while we were still enjoying the starters, so we felt a bit rushed. Oddly, several groups walked in after us but were turned away—unusual as there seemed to be numerous open tables in the relatively small restaurant. Ed’s Fried Noodles with Mixed Seafood entree. 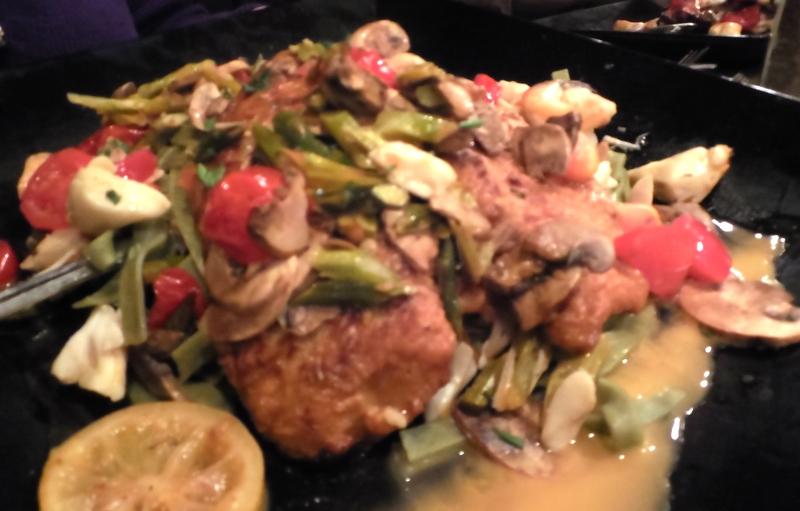 A close-up of Russ’s Duck with Black Bean Sauce. Scallops in Mandarin Sauce enjoyed by both Lynn and Karen. Karen and I both opted for the Scallops with Mandarin Sauce—with Karen ordering less-spicy, and me, extra-spicy. However we were both disappointed that the dish didn’t come with any vegetables. In hind sight we should’ve ordered additional veggie sides from their long list which included green beans, eggplant, broccoli, bok choy, and snow peas to name a few. We’ll know better next time. After dinner, the night was still young so off we went in search of a place for coffee and dessert. Just up the street on 11th, A La Mousse which specializes in cleverly created customized cakes, Italian pastries, cannolis, cream puffs, and eclairs, seemed to fit the bill. We walked in and snagged a picnic table just in time before the rush piled in causing a line out the door. A worker shows off a tray of gorgeous sandwich desserts. Karen and Russ ponder which desserts to order. Karen and Ed split a slice of Double Chocolate Mousse Cake. Russ enjoyed the artfully plated Tea-R-Misu dessert. Much to our chagrin, our favorite go-to Italian restaurant in Langhorne “Piccolo Trattoria” closed back in March, and while they have a couple other locations (Newtown, PA and Pennington, NJ), they aren’t nearly as convenient. 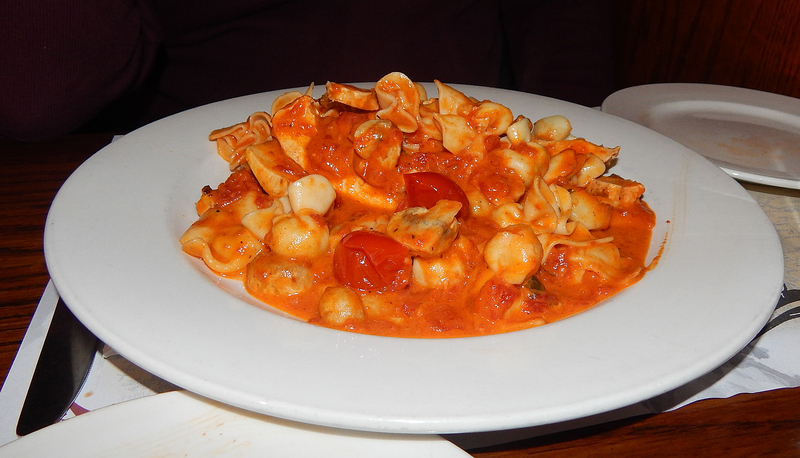 It had been many years since any of the four of us dined at Carlucci’s Yardley Grill (a family of six restaurants) in the Big Oak Shopping Center near Kohl’s so we decided to give it a try one Friday evening in October. And I’m glad we did! While the “digs” are nothing fancy, the home cooked food was more than passable (for most of us.) It is a BYO with a rather extensive menu that includes Classic Entrees, Favorite Selections, Italian Classics, Pasta Selections, and wood fired pizza; including gluten-free offerings. Our dining companions were Brad and Barb and while Brad truly enjoyed his Borsellini alla Vodka, let’s just say Barb was less than thrilled with her Eggplant Parmigiana. 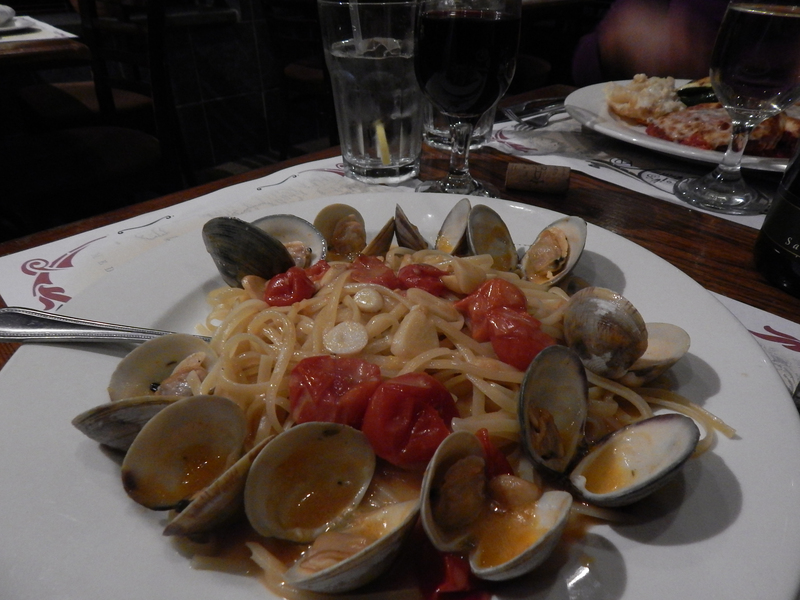 Russ said his Linguine Con Vongole was not the best he ever had, but it was good. 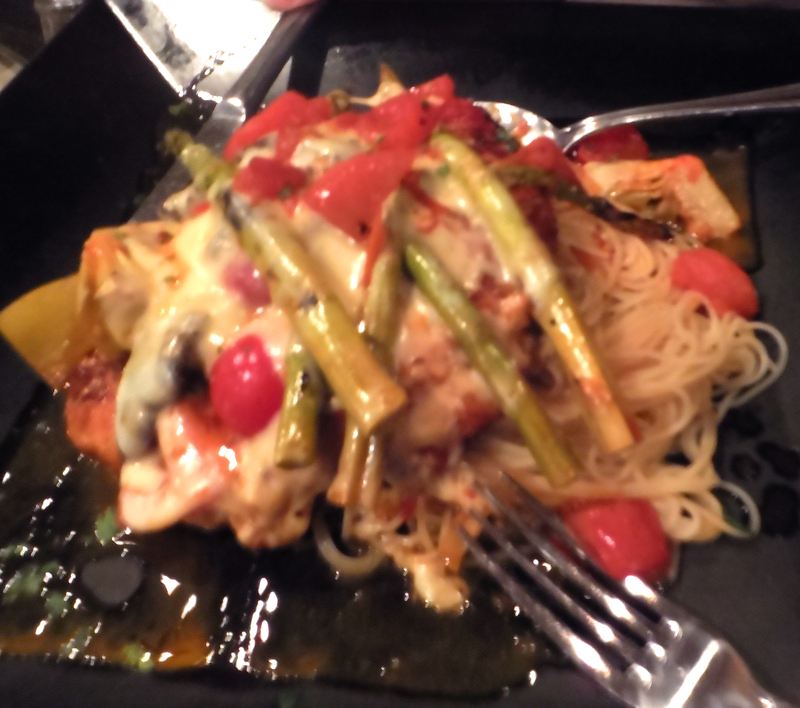 I was extremely pleased with my Chicken Florentine entree that came with lots of veggies, and I had a ton leftover to take home. Brad – Borsellini alla Vodka, Grilled chicken strips and mushrooms in a vodka cream blush sauce tossed with pasta pockets stuffed with prosciutto and cheese. Russ – Linguine Con Vongole, Steamed clams sautéed with garlic, olive oil, pomodoro, Italian herbs and white wine, tossed with linguine. 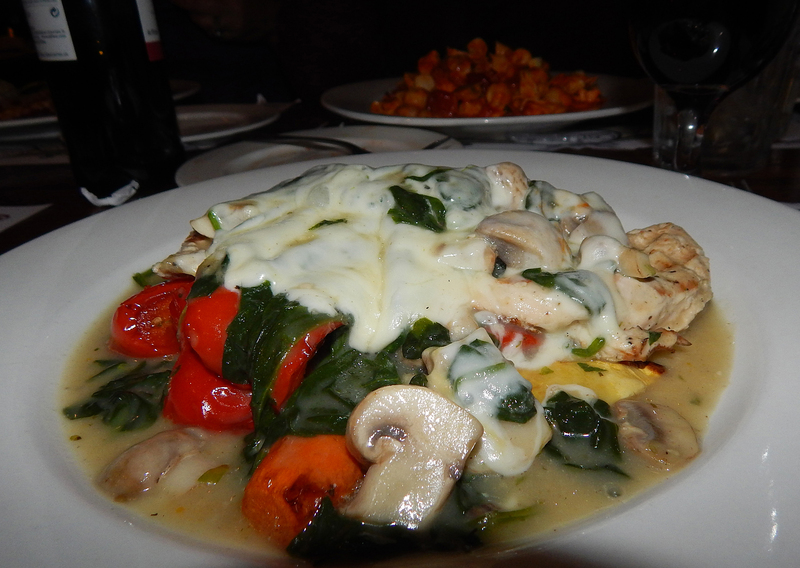 Lynn – Chicken Florentine, Sautéed chicken breast topped with spinach & mozzarella cheese, served on top of sautéed mushrooms in a white wine sauce over vegetables. 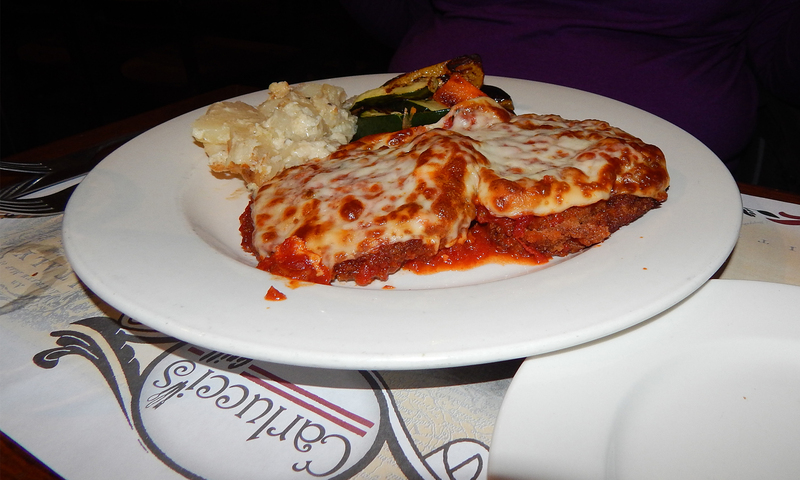 Barb – Homemade Eggplant Parmigiana, Served with pasta or vegetables. 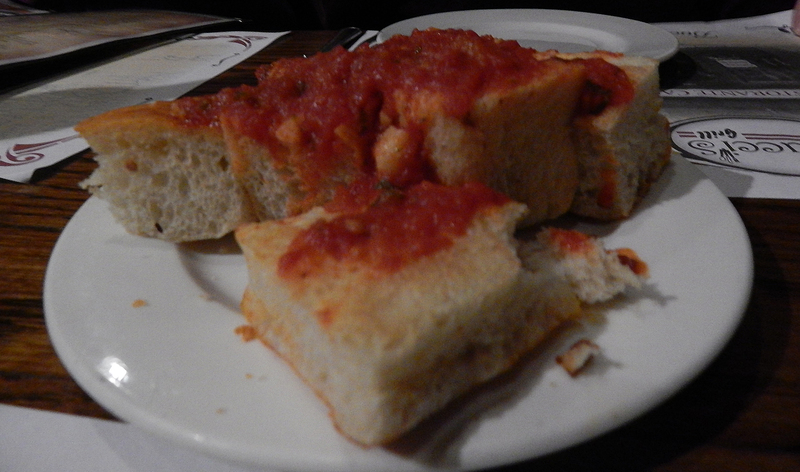 An order of bread topped with a marinara sauce was delivered to the table while we enjoyed our wine and waited for the orders. Russ decided on a side caesar salad (only $1.50 with a dinner) but was unmoved by it especially with the addition of tomatoes. Who ever heard of tomatoes on a caesar salad?? It wasn’t a total home run for all of us, but with so many choices and wood-fired pizza, I’m sure we’ll give it another try. Several days after Christmas (the day I drove back from Western PA to drop off my mother-in-law) I wasn’t in the mood to cook and Russ was working, so I suggested we try Carlucci’s wood-fired pizza. When we arrived that Monday evening, the place was packed, in fact, waiting room only. It wasn’t long though before they sat us at a small two-person table. 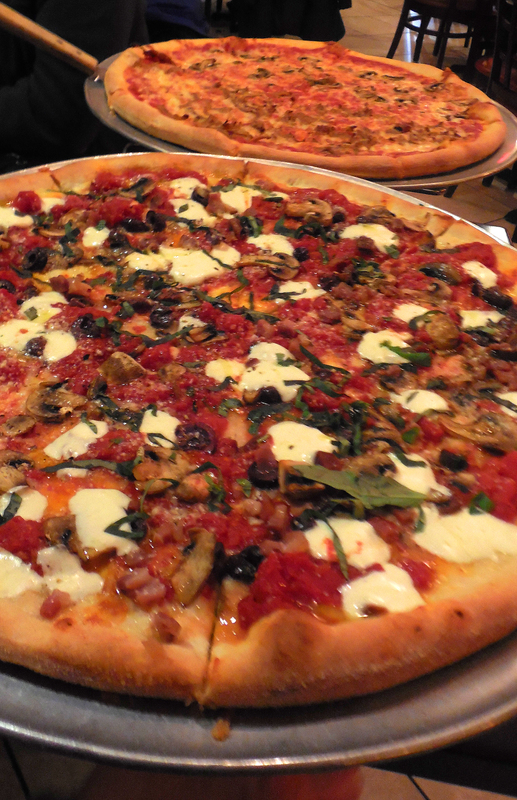 Their wood-fired pizza offerings are not extensive, and labeled as 12″ personal pies. Well let me tell ya, I ended up getting three meals from my pizza and Russ got two, so suffice it to say, you could easily share one pie. 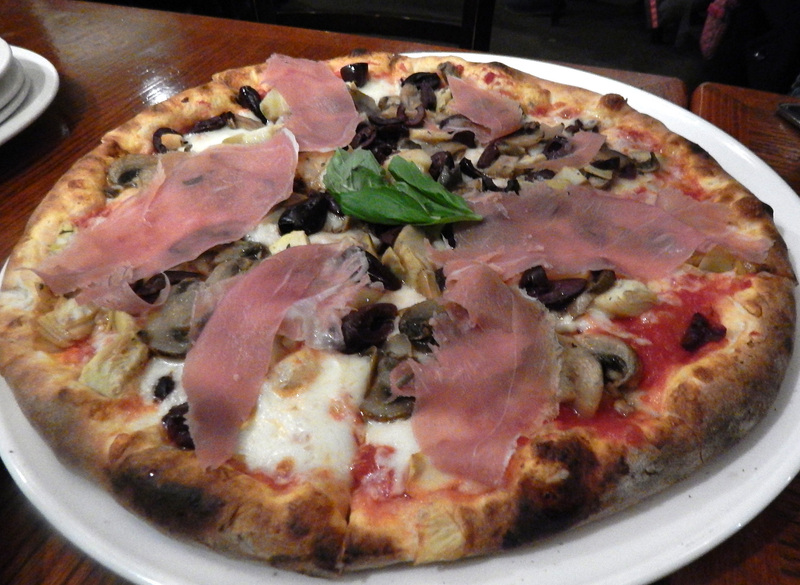 Russ ordered the Traditional Napolitano Pizza “Capricciosa Pizza”—prosciutto, mushrooms, artichokes, black olives with cheese and tomato; a well-presented pie that he wanted to compare to our favorite from Piccolo’s. While it was tasty, we gave the edge to Piccolo’s version, mainly because the the basil is scattered over the entire surface instead of one small bunch plopped in the center. I zeroed in on the Pizza Stagione—A unique pizza divided into quarters and topped individually with mushrooms, artichokes, spinach and roasted peppers. What I didn’t grasp was the fact that it was “divided into quarters” (or “stations” as the name implies) quite literally with each topping on a separate quarter of the pie. Not my ideal. When I had some the next day, I mixed up the toppings so that each slice contained a bit of each ingredient. What made no sense to us, was the plate of bread squares topped with a marina sauce delivered to every table — a nice touch indeed, however, we also were the recipients of a large baked bread round, which we deemed quite odd since they already presented us with a “starter” bread and we ordered two pizzas… talk about carb overload! 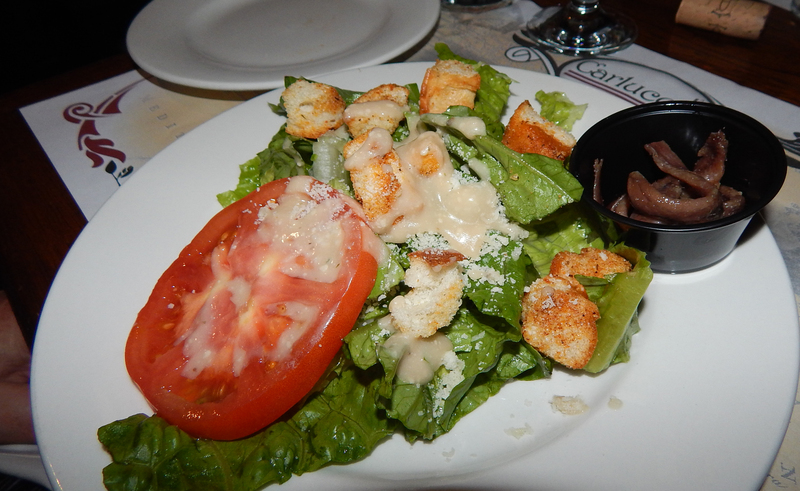 Oh, and Russ ordered the Caesar Salad again, which came topped with… you guessed it, a slice of tomato!? Rosanne preparing a new recipe of sautéed bay scallops. Not all that long ago, the Zarrilli’s did a total gut-job of their kitchen and transformed it into the true heart of the house with beautiful warm maple cabinetry, quartz countertops, sparkling tile backsplash and state-of-the-art appliances. They knocked down a wall and enlarged doorways resulting in a spacious and well-laid out kitchen with an easy flow to the rest of the house. And Rosanne, being the talented interior decorator and crafty person that she is, had every accessory placed just so, making it a truly inviting experience. 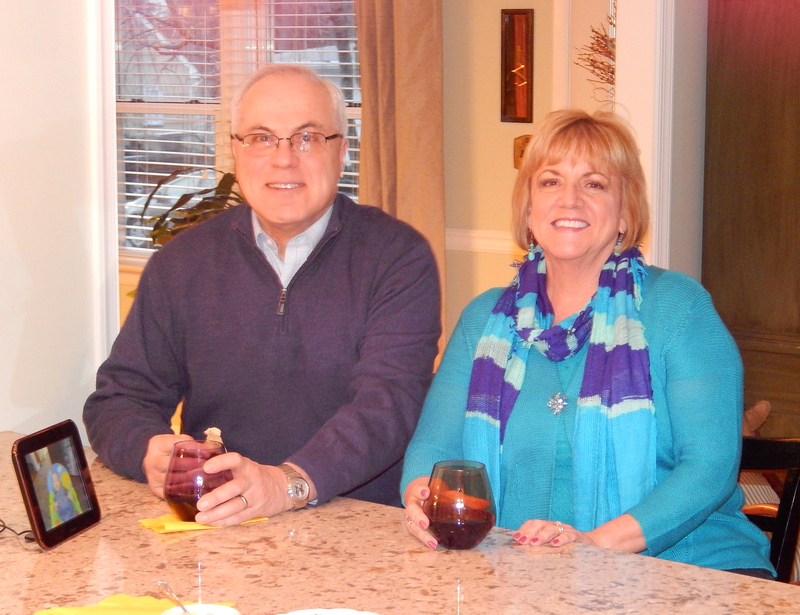 Gary Zarrilli and Lynn Holl enjoying a glass of Malbec. 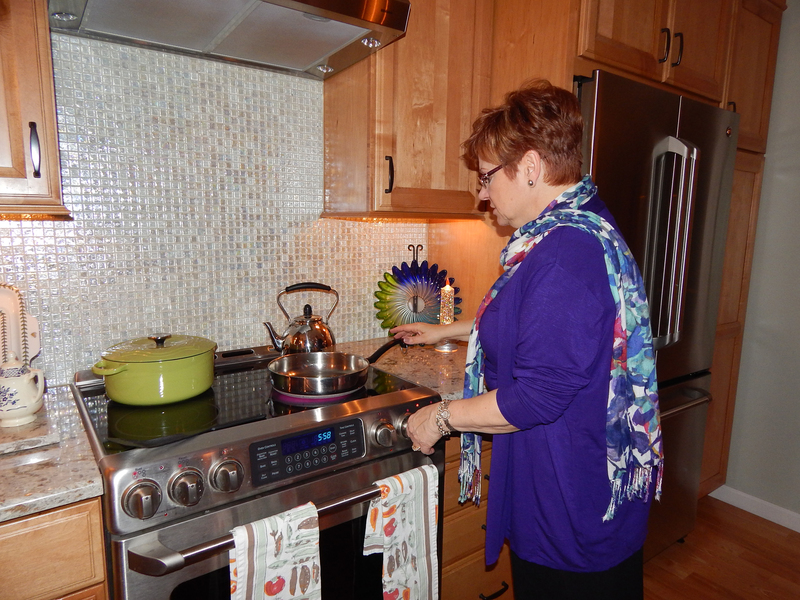 That night we arrived about 6 p.m., and Rosanne was at the stove trying out a new appetizer of sautéed bay scallops. While she worked on the finishing touches, Gary offered us a glass of Malbec and we happily munched on a platter of marinated mushrooms, snow peas and pita chips with a hummus spread. As the conversation turned to upcoming vacations, Russ mentioned our trip to Italy which prompted Gary to offer his “Espresso, Corso di Italiano” textbook as inspiration for Russ to learn Italian before our planned vacation to the Tuscany region the following month… Oh, and those bay scallops with a cocktail sauce were divine! Russ Hartmand and Rosanne Zarrilli discussing the merits of bay scallops. Rosanne took the liberty of making 7:15 reservations at one of their favorite Italian eateries, Genarros Italian Restaurant and Pizzeria on Nottingham Way in Hamilton, NJ. We arrived exactly on time only to have to wait 20 minutes, in a small vestibule with several other couples, for a table. Rosanne said that no matter where they go, Gary always runs into someone he knows, and that night was no exception, as he struck up a conversation with an exiting customer. Inside, the ambiance is cheery and the decor had a definite modern craftsman bent to it, but the noise level was almost deafening, and it wasn’t until many patrons started leaving that we could comfortably converse. The menu, while not overly extensive, made it hard to narrow down a choice, and to make it even more difficult, our waitress rattled off several more specials. After much deliberation, we settled on the following: Lynn chose the Spaghetti Scallops Puttenesca, pan seared dry sea scallops sautéed plum tomatoes, red onions, capers and kalamata olives; Rosanne selected the Veal Parmigiano with red sauce and mozzarella; Russ had one of the night’s specials of Seafood Risotto in marinara with a lobster tail, mussels and clams; and Gary decided on a House Specialty the Cappellini ai Granchi jumbo lump crab meat with shallots in a light sherry wine sauce (although he opted for a marinara sauce instead.) Whole wheat and gluten-free pasta options were available upon request so I changed my spaghetti to whole wheat ziti. 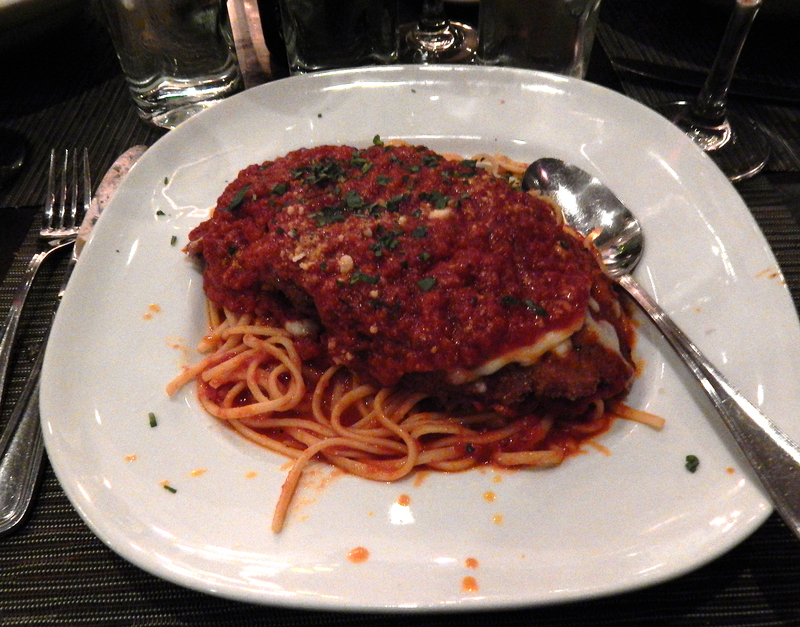 Rosanne’s order of Veal Parmigiano. 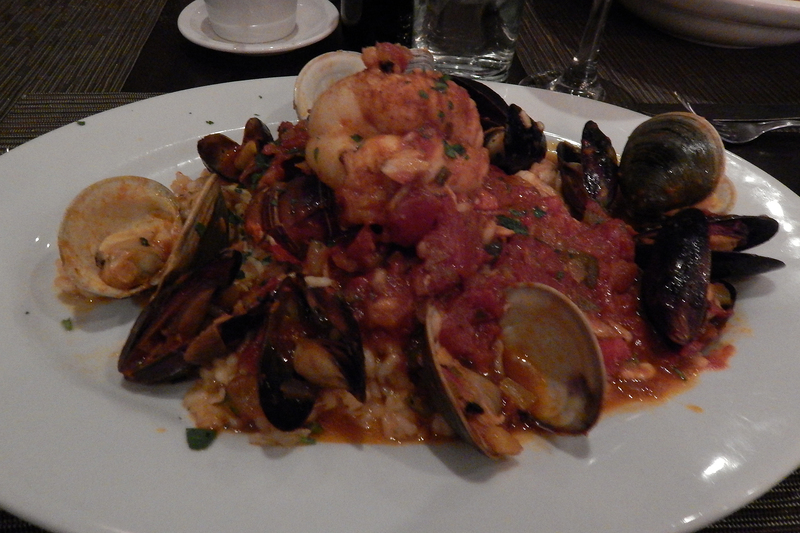 Seafood Risotto special of the night. 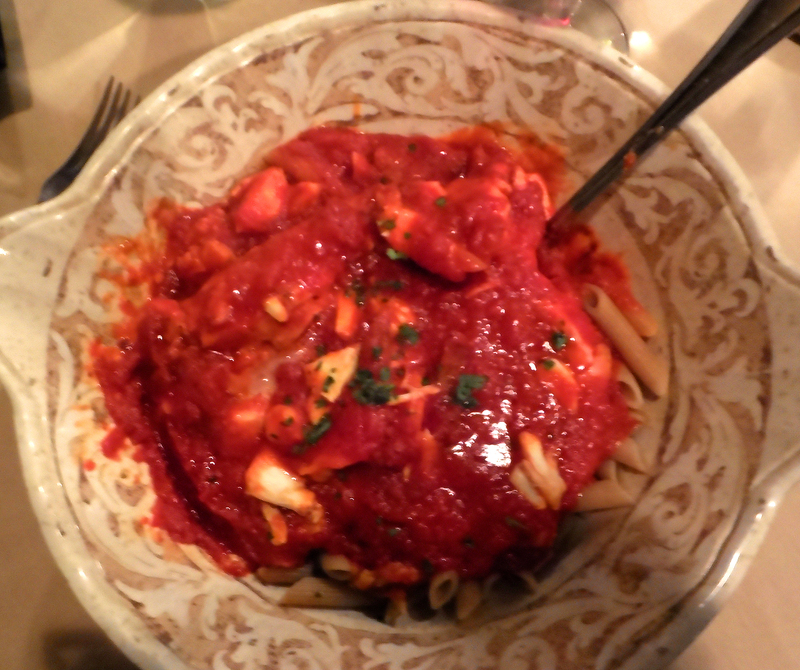 Scallop Puttanesca with whole wheat ziti. Cappellini ai Granchi in marinara sauce. A view into the dining room from the vestibule. Thank goodness for some nearby options for dining at a good Italian establishment! 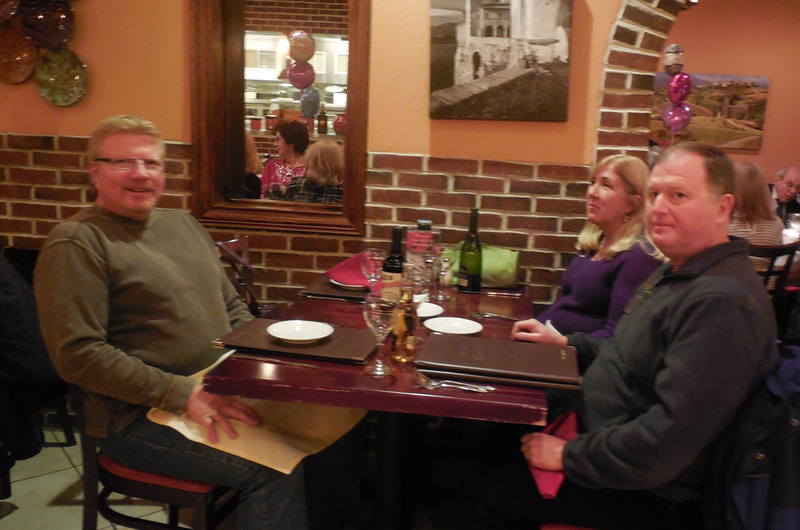 One of our go-to places is Piccolo Trattoria, a BYOB in the Langhorne Square Shopping Mall. And lucky for us, they maintained power when we lost if for four days during the Hurricane Sandy debacle, and more recently when we were powerless for 2 1/2 days during Nika, the February ice storm. But even without any weather drama, it is always a sure-bet when hungry for good Italian food, usually without a waiting line. In Italian, Piccolo Trattoria is more than just their name. It means “small, family-owned restaurant.” It is in this spirit that they have strived to build a close personal relationship between their guests and their staff. All family owned and operated, Piccolo Trattoria offers the perfect balance between a quick-serve pizzeria and a sit down casual/fine dining experience. 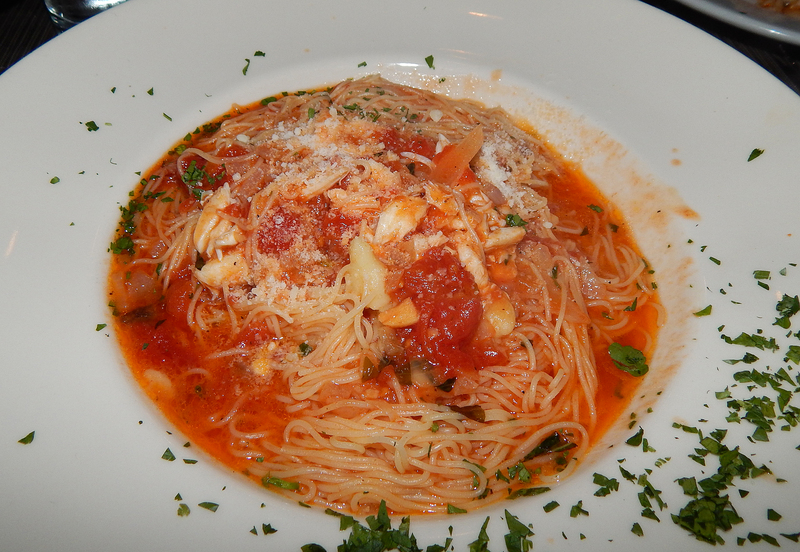 There are three locations, with the original just outside historic Newtown Borough; the second in Pennington, NJ; and the restaurant closest to us, the third Piccolo Trattoria restaurant which opened in 2009. 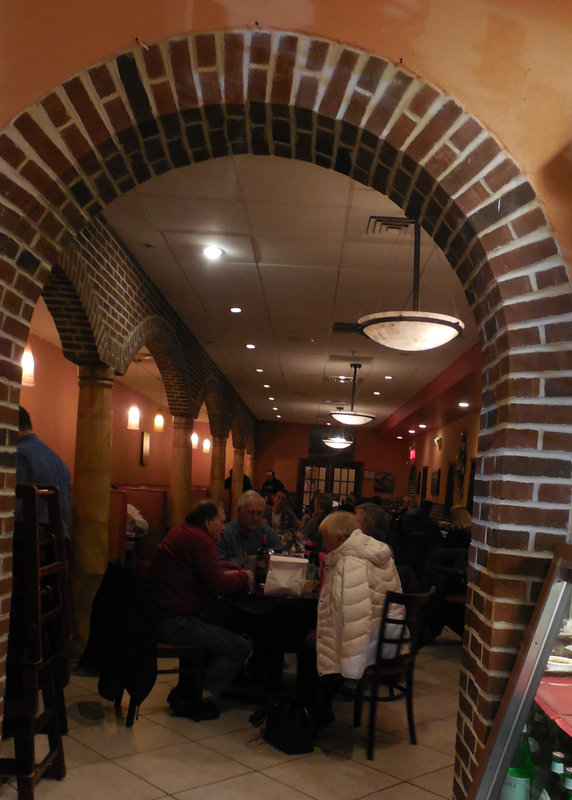 The Langhorne location is the largest of the three and features a private dining room. This makes it the perfect location for just the two of you, a friendly get-together, a family gathering, or corporate meeting. Piccolo is BYOB, so in case you forget to bring some wine with you, you can pick up your favorite beverage from the wine or beer store, located just a few steps from their establishment. 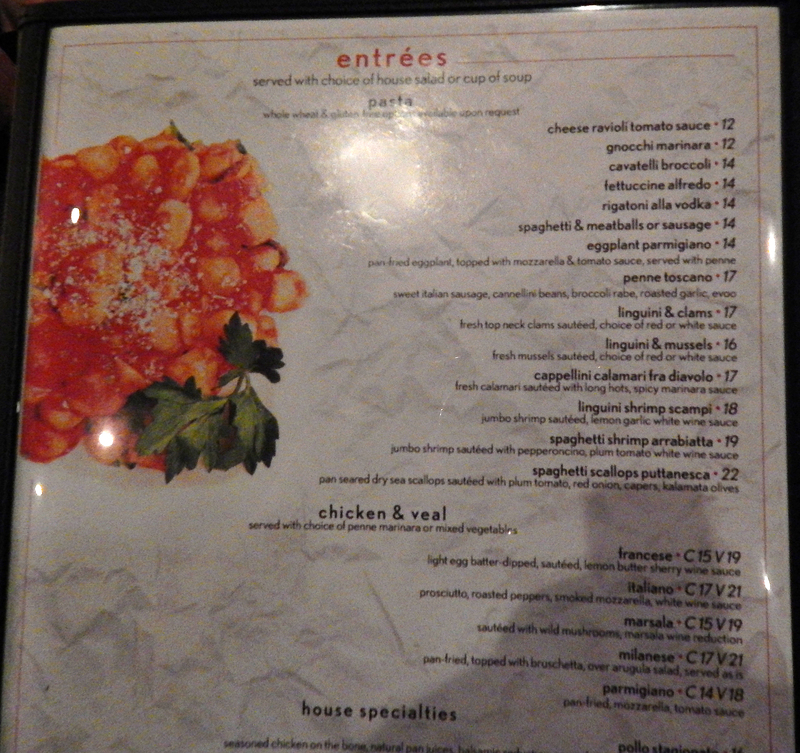 A peak at just a portion of their extensive menu. Their menu is extensive and also includes many options for pizza. And when pizza is what we want, our pie of choice is usually one of their wood burning oven options, the Capricciosa: plum tomatoes, mushrooms, prosciutto, kalamata olives, fresh basil and fresh mozzarella. Oh so tasty! 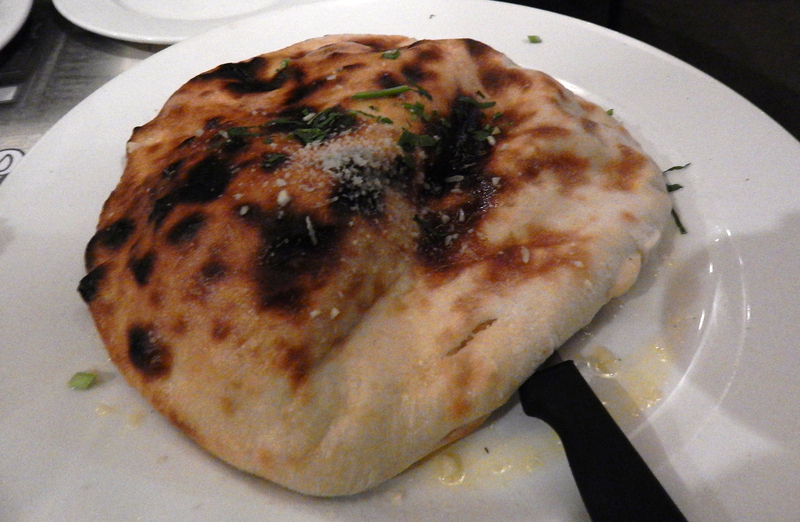 Lynn and Russ’ s favorite pizza: the Capricciosa. 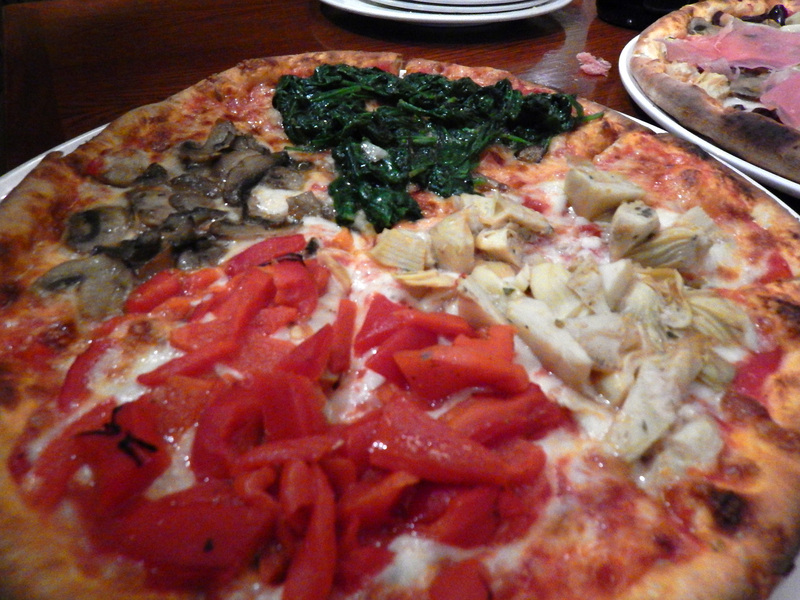 at bottom; top pizza is mushroom and sausage. Russ with good friends Barb Walsh and Brad Collins eagerly awaiting our pizza orders. Pizza is just a fraction of what Piccolo offers, and as good as it is, there are so many more delicious options to try. You can’t go wrong dining at one of their establishments! If you’re a social being, you probably love to dine with friends and family. Well Russ and I are no different. We entertain often, both in the home and out to favorite haunts, or trying new culinary experiences. 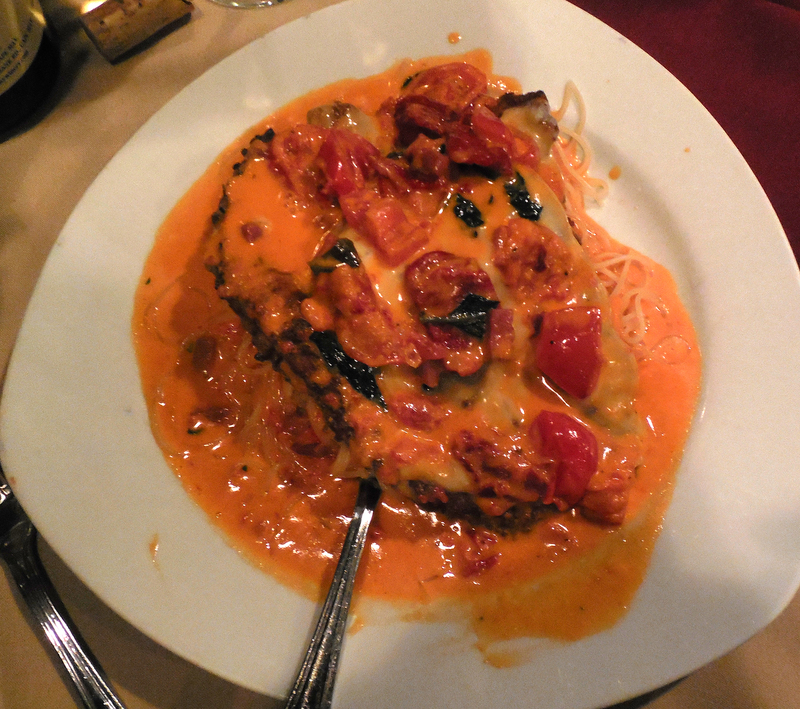 One go-to establishment that I patronize with work pals is Padrino’s Bistro & Italian Steakhouse, authentic Southern and Coastal Italian cuisine in Hamilton, New Jersey. 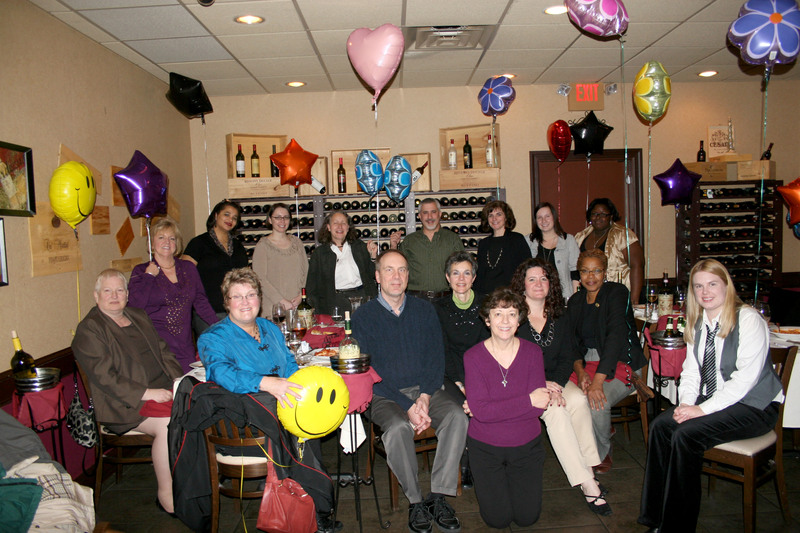 Here’s the entire MCCC College Advancement staff celebrating at Padrino’s in January 2012. There’s Italian cooking and then there’s authentic Italian cooking. If you say Italian is Italian, we say you’re wrong. So will our Executive Chef, Leonardo Coppola. His authentic recipes handed down from generation to generation back him up. Every dish tells a story as old as the hills in Italy, you just have to listen with each savory bite. Interpreter not needed. 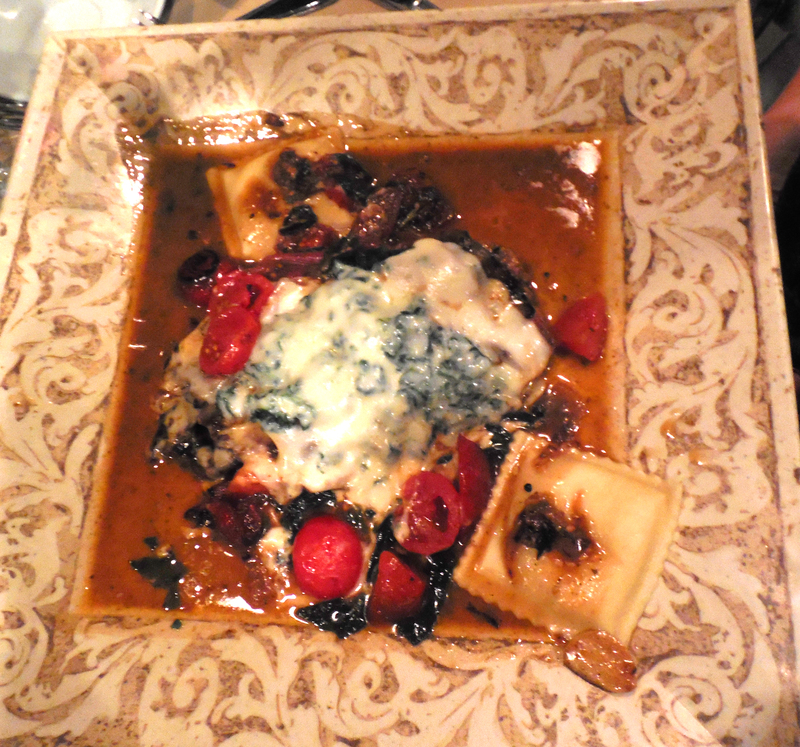 Native Italian food is a part of Chef Coppola who was born and raised in Monte di Procida, Napoli Italia. He spent his very early years in his Nonna’s kitchen, sitting on the counter watching and “helping.”That’s how it started. In that country kitchen filled with fresh tomatoes, basil, and olive oil picked from the families land, she taught him how to prepare the family’s homemade secrets. He learned you can’t rush a good sauce and fresh herbs and good olive oil make all the difference. The most important lesson Nonna taught: cook from the heart and the soul is rewarded. At 14 moved to New Jersey with his family. This is where his passion for cooking took off. His family openned Pasta Blitz which changed its name to Lambert’s Cucina in Lawrenceville. That’s where his mother reinforced the family’s traditional dishes…when he mastered them, he was encouraged to transform them; infuse them with contemporary influences. Judging by the menu, he’s been having a wonderful time creating new classics for a new generation. In 2005, he and his wife started several restaurants including Leonardo’s Mediterranean Grill & Pizza, Leonardo’s II Italian Restaurant, and Limoncello’s Café & Pizza. Due to a growing family and a commitment to his wife to not be a part-time dad, they sold their restaurants. He is now the Executive Chef at Padrino’s and a full-time, hands-on dad. I had the pleasure of dining there in mid-December 2013 with 8 staff members, most of whom have moved on to other jobs. 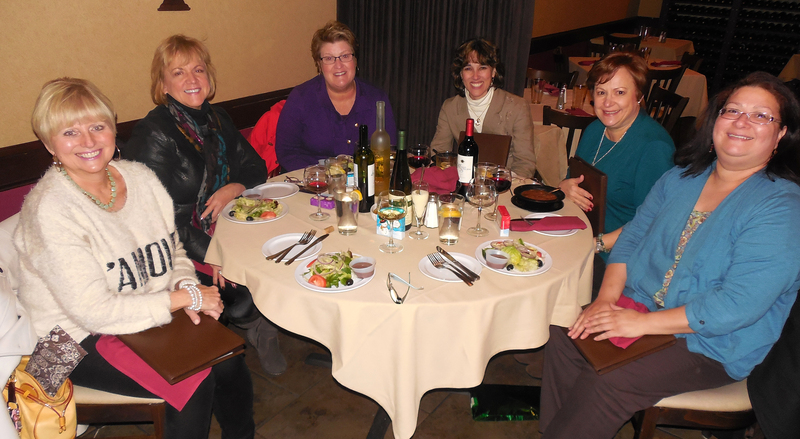 And again in early January with 5 other long-time MCCC coworkers. The food is scrumptious, the portions enormous, the menu humongous, with numerous additional daily specials that make it so difficult to decide. But whatever you do finally settle on, it’s sure to be memorable. If you’re ever in the area, please drop by for a tasty, authentic italian dinner.